Which is a better spacer system intercept or duralite? I would not choose one window over another based on that fact alone. 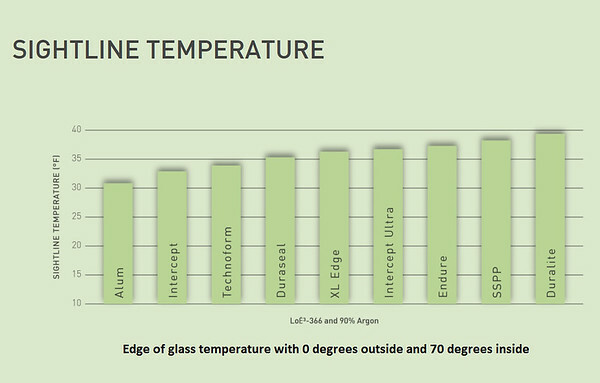 The duralite spacer will have slightly better edge of glass performance because it is entirely non-metallic, however, if the intercept is used in a better window, the overall performance will be better on the better designed window. There are usually a whole host of other differentiations in the window performance prior to getting to the spacer comparison. Thermally, the all foam Super Spacer is superior. Structurally, it is not. In fact I would not use Super Spacer for that reason. Um, the original message, posted six years ago, didn't even ask about Super Spacer. However, since it has been brought up, and a claim was made that it is thermally superior, I have to comment on that. SS is indeed thermally superior to Intercept. I don't know why people even bother with Intercept anymore since Intercept Ultra would be a better choice. But as for the claim that SS is thermally superior to Duralite, I would submit to you that they're close but that Duralite comes out on top (thermally as well as structurally). Perhaps what was meant in the previous post was that Super Spacer is thermally superior to Intercept and it wasn't being compared to Duralite. If that's the case, it makes sense. See attached graphic. Merry Christmas guys.